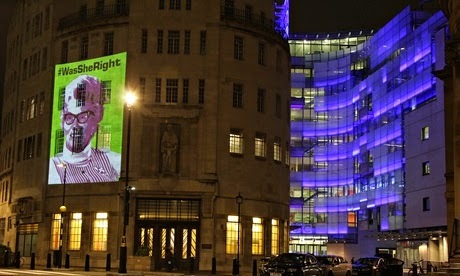 An image of the late Mary Whitehouse, scourge of TV’s moral turpitude, was projected onto the side of BBC Broadcasting House in London earlier this week to mark the 50th anniversary of Mediawatch-UK (formerly the National Viewers’ and Listeners’ Association), the group she founded to campaign for “socially responsible media”. Monkey is not quite sure what Whitehouse would have made of the anniversary being marked with a PR stunt previously employed by FHM to project a naked image of Gail Porter onto the Houses of Parliament, but there you go. Mediawatch-UK also marked the anniversary by publishing a survey in which, when asked “Have you ever seen anything on television that you felt was inappropriate prior to the 9pm watershed”, every single one of the 2,009 respondents replied in the affirmative. So that’s a 100% yes vote – the sort of poll result more usually associated with places like North Korea. Did Mediawatch-UK employ Sir Humphrey Appleby to set the survey questions, per chance? Mediawatch-UK's website is a constant source of mirth.